There are 50 strong and meaningful memories here for me, web but they might just has easily have been replaced by a different 50. Well, approved that’s not strictly true, of course; these 50 were selected after careful consideration and sifting, but there were another 50 which, when I thought about it, could have made the cut. And probably another 50 which… Ah, let’s not go down that route. Eros Ramazzotti – Quanto Amore Sei A taxi? From Turin? Human League – Being Boiled Hamlet? In one act? Tanita Tikaram – Good Tradition strangely, Edinburgh. Dandy Warhols – Get Off a new bypass? Laurie Anderson – O Superman GI Records, Cockburn Street. Many thanks to those here and elsewhere who have been supportive of the project; we're off to San Francisco this morning, but thanks to the positive feedback, one more poor sucker kind person has been sent a copy of part 1, and I feel much more enthusiastic about getting it out there, warts and all. Got windmills? I fancy a tilt. Once we're back home, of course. I know that few people will have the opportunity to be introduced to this awe inspiring music in that fashion, but I really do recommend it. Of course, I had to own a copy, and of course, I had to listen to it as often as possible until I felt I knew it - I can hum, or whistle, great chunks of it now, much to people's bemusement. And I knew I had to see it performed again. The opportunity presented itself in 1999 - Sir Simon Rattle, and the Vienna Phil - this is going to be even better, I thought, as I planned to spend the whole day queuing if necessary. That summer proved to be a traumatic one, as Zoë's mum died suddenly whilst visiting us, and I don't think I had even begun to recover from the shock by the time I took my day off work to sit on the pavement in Kensington Gore. I did have high expectations of the evening, but I wasn't really prepared for the emotional power of it all. The whole symphony is predicated upon the idea of resurrection; of life going on, even renewing in the face of tragedy, and that evening, the whole performance seemed to be directed only at me. There were several moments where the hairs on the back of my neck really did stand up, and several more when I felt close to tears. Which, of course were finally produced by that choral entrance; joyful, defiant and overpowering. I have never experienced anything like it, and I don't suppose I ever will again. There really was only ever going to be one final entry in this list. Clarification: the “see here for details” link was to a wildly over the top website of people’s mystical reactions to Mahler’s music. It was a wonder of its time, but nowhere to be found these days. Otherwise, what I think now is that this was always going to be the final entry, even ten years later. Nothing I have heard has ever come close to inspiring in me what Mahler does, and I doubt anything ever will. And I’m just fine with that; Stephen Fry would have me believe that the operas of Richard Wagner are even better, but I have reservations about Wagner which are purely personal; I try to set aside the person from his music, but it’s hard, and I find that the opera form for me can sometimes get in the way of the music – opera and symphony are different things, but I’ll always prefer the symphonic form. I hope that in ten years time, something else will have even more effect on me than this wondrous symphony, because I don’t like the idea that nothing better could ever be achieved. But if it’s not achieved in my lifetime, I’ll lose no sleep over it. My aim hasn’t been to encourage anyone to like the things I’ve presented here; simply to write a memoir of sorts using music as a structure. I can’t insist that you go out and listen to Mahler, far less enjoy or even like his music. But, trust me – if you can give yourself over to the Second Symphony, you’ll hear things you’ve never heard before, and that can’t be a bad thing. I have another recording of it, by Gergiev and the LSO, which I bought at the Royal Festival Hall music store on my way home after my mother’s funeral. It’s not my favourite recording (nothing I’ve heard yet beats Rattle and the CBSO), but it’s a third strong memory of this symphony. Yet it doesn’t change the way I feel about it; I have memories of the music, but the music doesn’t necessarily conjure up those memories – when I listen to it, it is usually with a clean slate; ready each time to find something new. And that, in the end, is what this journey has been about. I can take comfort in my memories, and enjoy the nostalgia as much as anyone, but every day, I’m hoping to hear something else, something new; ready to start the journey to the next ten years’ memories. So there had to be some fallout from all that noisy, hairy stuff that I immersed myself in when I first went to Edinburgh, and it turned out to be this lot. Something about them appealed to me straight away. Well, lets be honest, intelligent lyrics, clever musicianship, staggeringly good drumming and proper use of things like science fiction were always going to ring a few bells with me. I was intrigued by name checks for the likes of Ayn Rand - interestingly, using her name seemed to provoke critics into knee-jerk accusations of extreme right wing activities something which the merest effort of research would have debunked - and enthralled by a band which, having hit on a winning formula, would tend to do something entirely different next time around. There was a time when I owned all their records, even the frankly hatstand collaboration with Max Webster. And eventually my enthusiasm faded to normal levels, and then to almost nothing. But I own some of their music on CD, and occasionally look in in their websites to see what's going on; and if some of their music no longer has the power to thrill like it did, some of it still speaks to me. So when I remember Rush I remember Edinburgh, and up to a point vice versa; certain songs bring back very specific memories. The thing I remember most vividly, however, is my very first arena concert. Scotland had precisely no large scale indoor venues in the early eighties, so someone had the brilliant idea of using the Ingliston Showground Exhibition Hall. Without being unkind, it was a vast cowshed with a temporary stage at one end. The view was strictly limited, and the acoustics appalling. But it was still one of the best concerts I'd ever seen - partly due to the anticipation, and partly due to the genuine quality of these three guys. There's not much from that time that I remember with great affection, and hardly anything I'd actually spend money on now, but I make an exception for Rush. I think there may be hope for me, if I can do this next bit without being so mealy-mouthed. I fell under the spell of Rush when I was still at school, and, in spite of a period of not buying new releases in the 1990s they never went away. What was certain was that Rush were not ‘cool’. Never have been, and probably in some parts, never will be. That, to my shame, affected how I wrote about them in 2002. Mark Stephen had a copy of ‘Permanent Waves’ in the common room one day. Everyone listened, nodding thoughtfully along to ‘Spirit of Radio’, pretending not to notice the looks we were getting from the punk girls, and most of us moved on. I went out and bought Rush albums. Not all of them, and – strangely – not the one I’d been listening to, but enough of them to know that I loved this band. I studied them because there were intriguing lyrics, and because I wanted to be able to play those melodies; I listened to them in Edinburgh because they at once tied me to home, where I had first heard them, and promised a wider world to explore; I liked them partly because no-one else I knew did – I knew other students who had much cooler musical tastes than me, but I didn’t really care. And then, as my tastes changed, everything but Rush dropped away. I hung on to them because they were ‘my’ band; part of my life in a way nothing else ever was, and nothing would be until I discovered… no, let’s not get ahead of the story now. Actually, there are lots of Rush memories. I came back to them in 1999. I was in the Virgin Megastore in Brent Cross; I suspect I had a voucher to spend or something, and on impulse I bought ‘Different Stages’; it plugged me right back in as though I’d never been away. The live performances seemed looser, more relaxed and inviting than before, and I could feel the joy in them. And, like most people, I guess, at that point, given what had happened, I imagined that the story was over. Has there ever been a more defiant comeback than the opening bars of ‘One Little Victory’? I saw this on the ‘Rush in Rio’ DVD, and from that moment, I was back in the world of Rush, the rock band which means more to me than all the others put together. My children (and Zoe, to a degree), having been exposed to Rush for most of their lives, are also fans (nothing to do with me, honest. Well, not much). Cameron is a budding drummer; he can be heard in the basement some evenings, trying to play along with ‘Tom Sawyer’; Conor is a guitarist, his version of the opening of ‘Limelight’ is my favourite of all I’ve heard. Last year, Rush played in Vancouver; how could we not go? The whole thing was a fabulous experience ; fully 28 years after I’d last seen them in concert, they were – well, spectacular doesn’t begin to cover it. But the songs they played and the fun we had isn’t my favourite memory. Cameron recording the entire drum solo on his phone isn’t my favourite memory. Conor grinning from ear to ear at the interval, having sorted out the ‘too loud’ problem and the ‘can’t see’ problem isn’t my favourite memory. Even the on-stage fight between the hockey mascots isn’t my favourite memory. But here’s what I do remember. I went to Scotland three times that summer; once with the family, as already noted. I remember many things about that visit, but they’re transient things; impressions – the cottage we stayed in, the arguments with the car hire company, the Falkirk Wheel - but it’s not etched into my memory like the others. The second trip was my insurance policy. Thanks to the Canadian weather, we had some unused BA flight tickets. We decided that I should use them to go and say goodbye properly; I knew that if I was back for a third time, I’d run the risk of being too late, and however much you don’t want to face the reality of what’s happening, you definitely don’t want to add regret to the emotions. So here are these glorious, sweeping songs of – well, who knows what: I certainly don’t have enough Icelandic to be able to make sense of them – and a period of my life where I am emotionally heightened; it’s a wonder I can still listen to any of it. Yet, that’s the point, really – this music is strong enough to overcome negative connotations, and when I listen to it now, it makes me happy, and thoughtful, and sad, all at once. Like I say, I listen to it from time to time, and when I do, I remember. I remember growing up, long before I ever heard it, but it reminds me of childhood, and of my safe, loving upbringing; it reminds me to be grateful for all I have and have had. I remember texting my mother from the Skytrain, on my way back to see her that August – telling her how beautiful Vancouver looked, and that I’d be at her bedside this time tomorrow. I remember walking the streets of my childhood in the rain, thinking about anything and everything, trying to digest what was happening. I remember lying awake in the middle of the night, wishing for the limbo to be over, and feeling guilty about that. I remember doing the practical things the day after she died; writing an obituary, talking to the minister, and hearing myself say “I think someone should give a eulogy, and I think it should be me”. I remember standing in the church, feeling glad that I was here, and hoping that everyone could hear me; my actor’s training having deserted me as I read those words. I remember sharp, crisp memories, inconsequential things which meant a lot to me at the time. And, most of all, I remember my mum. You know the drill by now. 2012 will, I think, in retrospect, feel like a momentous year. In many small and subtle ways, things changed this year. Not just the process of surviving another year which ends in a 2, always a risky thing for me, but because the family unit is shifting. These bright and brilliant boys who entered our lives not so long ago are beginning the process of moving out of our orbits and finding their own paths. When your younger child goes off to secondary school, you have to face facts: they’re really not kids any more. Cameron will remember this year as the year he started on the path of serious exams and momentous choices; we all get there eventually, and I think for most parents it must feel like it’s come too soon – my baby can’t be ready to be sitting exams where the result might stay with him for the rest of his life. Yet here we are; Cameron is doing trigonometry problems and solving them quicker than I can, because it’s fresher in his mind than in mine. I’m reaching that point where – in some subjects, anyway – I’m no longer ahead of him; I’m learning along with him, and hoping that age imparts some clearer understanding of the wider picture so I can help to put things in context. And Conor will remember 2012 for just as many things, but I think primarily for being a participant in the BC Summer Games. That independence, which perhaps has not come quite as easily to him, blossomed in the environment of the Games; corralled away from parents, being part of the group with just his team-mates and coaches – overnight on the bus, nights in dorm rooms, and games where no parental input was obvious – just him, his team-mates and his coaches against the world. Well, the rest of the Province, anyway. The Games felt momentous to me. Our youngest, off on his own, doing his own thing and making his mark on the world, however small. The sense of pride was enormous; pride in him, doing these things, being part of a massive event like that, but a tiny bit, I think, of pride in ourselves as parents – so far, we’ve done an OK job. So, you’ll forgive me if I was a little emotional watching the teams file in for the opening ceremony. You’ll forgive me if I was affected by the simple, joyous optimism of the theme song, and – I hope – you’ll forgive me for remembering one moment which just felt magical, right at the end. During the summer, we had all become aware of the original version of ‘Somebody That I Used to Know’; we liked it, but the boys and I in particular were enthralled by the Walk Off The Earth version – 5 musicians, one guitar, and such evident fun. Music can be hard to learn, but the rewards are enormous. We loved the video, and resolved – well, I did – to find out a little more; they are, after all, a Canadian band. But there’s never time for such fripperies – we have lives to lead, soccer tournaments to play, and Summer Games to attend. Once the games were over, and we had all calmed down a little from the intensity of it all, there was just the closing ceremony to go. Like the Olympic ceremony, it is altogether less formal; the teams come in mingled together, many of the participants wearing their medals with pride; all of them buzzing with the energy only being part of something so big can impart. There were speeches, as you’d expect, and there was music – the theme song again, with now much swooning from teenage boys less anxious about the immediate future. To our delight and surprise, Walk Off The Earth are invited up on to the stage. They play ‘Summer Vibe’ and it instantly becomes our summer 2012 song, athletes and parents singing along, grinning madly. They troop off again, to my mild disappointment – presumably it’s a little hard to recreate the whole ‘5 players round one guitar’ thing live, and I'm guessing it’s not been on the timetable anyway. Music is magical. I could have done this with books or movies, or football matches, but it wouldn’t have been the same. I’ll never forget how that felt, watching something unexpected and delightful, knowing that Conor is watching it from somewhere else in the arena, and making his own musical memory, and sharing the experience with him without even exactly knowing where he is. Get used to it, Dad – this is how it’s going to be. There hasn’t been a ‘since then’ yet – come back in another ten years; we’ll see. Look at the date. It’s in the future. Back then, that is. I wanted to try to contextualise the Proms a little more, to explain a little how much they meant to me while I was able to attend, and what exactly it is that changes my musical understanding simply by being in a crowd of like-minded individuals, listening to music while ignoring my aching calves. July 27th, 2003. It’s a Sunday, so I might have shown up at almost any point in the afternoon, but given that it’s not likely to be sold out, I’m guessing I got to the queue around 5.30. I almost certainly drove in, since parking is free around the Albert Hall on Sunday evenings (in fact, I think it’s free all day Sunday at this point. I doubt that it still is.) The queue is a significant part of the enjoyment of the evening; you might be in line with friends; you might meet someone who knows the composer or conductor; you might meet family members coming to cheer on a performer; you might equally well bring a book and a Marks and Spencer sandwich and just sit there, on the steps or along Prince Consort Road, and watch the world go by. I have had all of those experiences, and cannot elevate one above the others – whatever happens works for that particular evening. That evening was themed – not a particularly common experience for the Proms, although, of course, programmes are designed so that they flow and make sense together, but an actual theme is less common. The theme is mourning, and the reason I was so keen to see it was the conductor – John Adams, one of the foremost living composers, conducting three works I am vaguely familiar with and ending the evening with the UK premiere of his work written in response to the events of 9/11. The first piece is one of those Haydn symphonies I was so exercised about back there. I’d never heard it before, and I remember enjoying it perfectly well. It is called the ‘Trauersinfonie’, or ‘Mourning Symphony’, setting the tone for the evening without being gloomy or ponderous. It’s perfectly fine, and enjoyable, but it is instantly sidelined in my memory by what comes next. Now, I love a Piano Concerto. I’d say that, after the long-form symphony, they are my favourite expression of the classical style. However, I had never heard Bartok No.3, written as he was dying (and indeed not quite finished by him), so I wasn’t sure what to expect. I was, as they say, blown away by it. It instantly became one of my favourite pieces of music, thanks to a scintillating interpretation by both conductor and soloist. That’s why I love the Proms so much – new stuff which just becomes part of you. After the interval, we are treated to some Copland – Quiet City, not a piece I knew well, and intended as a counterpoint to the finale. It worked well, but perhaps was just a little too optimistic given what came next. The final piece is what we came for – Adams conducting his own ‘On the Transmigration of Souls’. It’s startling, partly electronic, partly on tape, inspired by, and partly about the passengers on those doomed aircraft, but also in a way about all of us and how we might face the end of our lives. I found it profoundly moving in places, and strangely optimistic; not a reaction I had expected. It’s hard to process new music sometimes, not because it’s impenetrable or innately ‘difficult’, but because, never having heard it before, you’re trying to comprehend what you’re hearing as you listen for themes and motifs. Not a problem I ever had with a Saxon song, I grant you. Well, I certainly bought some Bartok. Indeed, it’s one of the few pieces I have more than one interpretation of; if you’re intrigued by it, try to find Marta Argerich’s version – it’s seriously impressive. I didn't buy copies of any of the other pieces from that night, but that’s mainly because the Adams wasn't available. It has since been released, and I ought to have a copy of it to go alongside my copy of ‘Short Ride in a Fast Machine’, which has a whole other Proms story of its own, but since its mainly about how I seemed destined never to hear it, that is perhaps for another time. A little preamble, adiposity if I may. The final five are somewhat out of sequence, no rx and I like to think there’s a reason for that. I think these next five memories coalesce into ‘well, here I am now.’ Probably only the final one is in any kind of order – I can’t imagine anything surpassing it as a memory, or as two memories, and it’s up there because how could anything come after it – it would be wrong to have it as the midpoint of this list, and to end with something from 2012 which might not last. Nothing. I’d never even heard of them back then. There now follows the first of two memories which deal with 2009 and the fact that my mother was dying while I was living 5000 miles away. This had not been in the plan when we moved, although it is an inevitable part of what you consider before you undertake a move like that. For all that we knew that such things were possible, having already lost Zoe’s mum, we felt that there would be a good few years left before we would have to face such things. However, fate deals the cards it deals, and I found myself flying back and forth across the North Atlantic several times that year. On the first trip, the entire family went, and while we were keeping things as light as possible, even the boys knew deep down that they were saying goodbye to Grandma. I wasn’t in denial, but I was open to distractions, and music turned out to be one of them. Before boarding the return flight, I picked up a copy of a magazine devoted to Prog Rock. I’m not prone to public self-analysis, but it’s pretty clear what was going on there – I was revisiting my youth; the time before any of my immediate family showed any signs of encroaching mortality. I read happily articles on ELP and Rush, and several others I had mostly ignored at the time, and I felt a certain nostalgic pull. 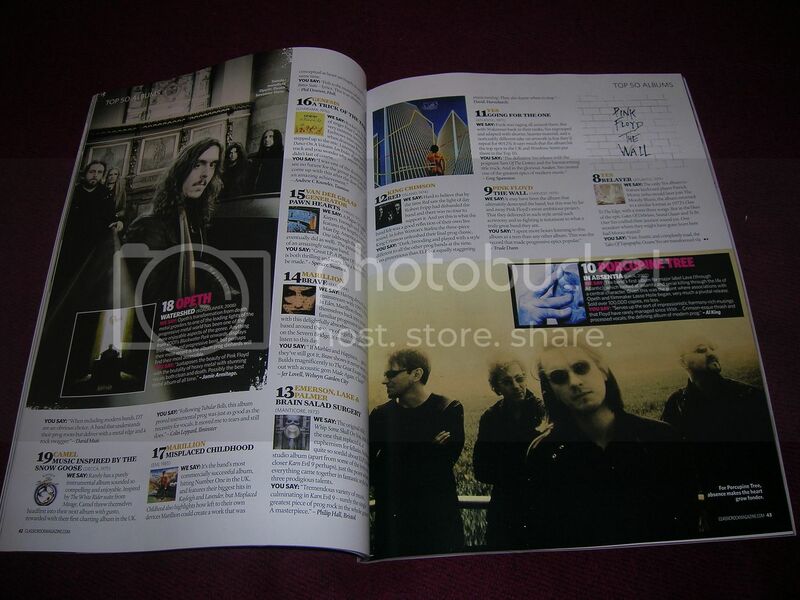 There was also a list of the 100 best Prog albums, or at least, that’s how I remember it. I’d have struggled to name 100, of course, but I was intrigued by the top 10, which featured pretty much the albums you’d expect, and one I’d never even heard of; Porcupine Tree’s In Absentia. Since I was, to a greater or lesser degree, familiar with the others, I resolved to make myself familiar with that one. I downloaded it, and played it incessantly al that summer. If you’d asked me what the music reminded me of, out of context, Yes, Genesis, Pink Floyd and so on wouldn't have really registered – it’s modern rock music, of the type that the likes of Muse seem to be able to make effortlessly popular. Only, to these ears, somewhat better – less bombastic and more, well – personal. And I think it’s the personal which resonated. These aren't songs which particularly related to my situation that summer, but they were songs which did genuinely seem to matter. I loved the sweep of them, the power of ‘Blackest Eyes’; the industrial edge of ‘The Creator has a Mastertape’; the melancholy of ‘Heart Attack in a Lay-by’, and most of all, the honest appraisal of ‘The Sound of Muzak’ – a subject dear to my heart. There’s another memory, as we’ll see shortly which is the sound of the autumn of 2009, which reminds me of the sadness and the turmoil, but this one reminds me of that uncertain summer, and how reconnecting with the music of my youth somehow kept me grounded enough to do what had to be done. Enough lists. Go try some, as they say round here. I’m really not sure where to start with this, physician because my memory of this is playing it very loud to my children and some of their friends as we went to an open day at the London Gliding Club. It’s not my only memory, information pills of course, ambulance but it’s a startlingly clear one – trying to surprise or intrigue a bunch of 7-year-olds with some of the weirdest noises they’ll ever have heard in the name of music. What’s not clear to me is when I first heard it, or what prompted me to buy it, because for all that it has something of a reputation – and perhaps not the reputation you might imagine, either – I was very busy at that time with many other things, and I can’t imagine that ‘get to know Messiaen’ was high on my list of things to do back then. So, all I know for sure is that I own a copy of it, and I would play it during long car journeys, and slowly the seemingly impenetrable music would open itself up to me, and I came to love it. If you know anything at all about Turangalila, it will be that it features the early electronic instrument, the Ondes Martenot. 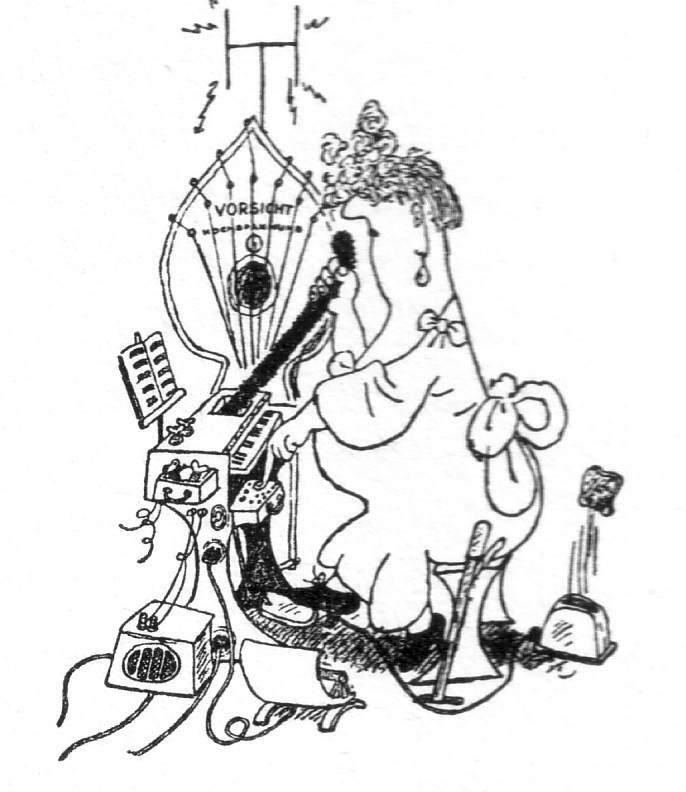 I was first aware of the Ondes through the work of Gerard Hoffnung, q.v. and to be honest, I desperately wanted to see one in the flesh, to see if it lived up to Hoffnung’s demented vision. And, you know, it very nearly does. It is a brilliant thing, and a wonder to see played, even if the piano does tend to overpower it in places. The Prom which featured it is one of my favourites, mainly because it truly is a bonkers instrument playing bonkers music, but it all makes sense. Highly recommended, should you ever get the chance. There was another Proms performance this year. It’s harder for me to see them these days, of course, but even more than some of my cast-iron favourites, I wanted to see this done again. It doesn’t ever disappoint.